Unless you’re a full-time chef, no one has time to spend all day every day in the kitchen cooking healthy, delicious meals. That’s where meal prepping comes in! But if you’ve ever scrolled through other people’s dazzlingly colorful and impeccably organized #mealprep posts, you know it can be a little intimidating to just jump in. So starting September 3, the LIVESTRONG.COM team is hosting a 30-day meal-prep challenge just in time for the start of a new school year. Even if you don’t have kids or are heading back to the classroom yourself, September is a great time to check in with your healthy habits and set yourself up for success. 1. You’ll save time. Making food in bulk at the beginning of the week saves you time throughout the week. 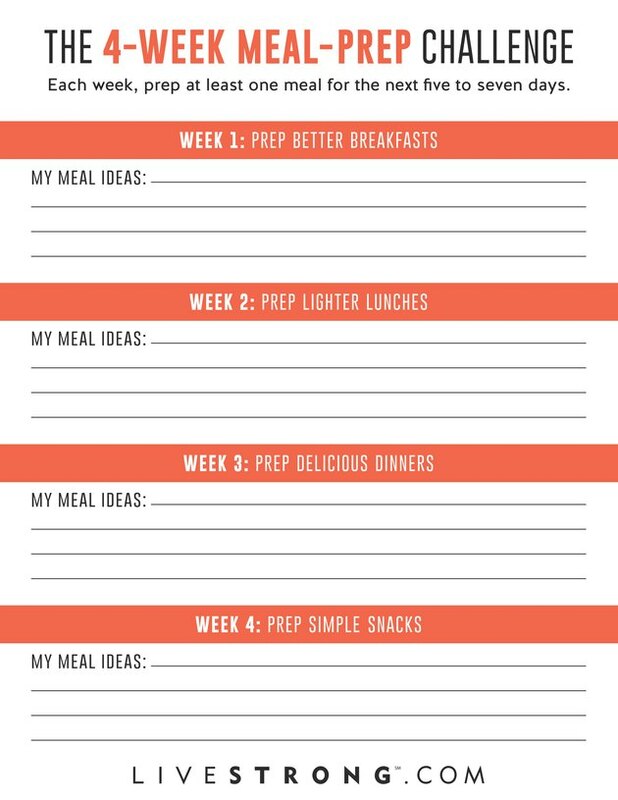 Whether you prep just dinners or all your meals, you’re front-loading your week and freeing up time during the week for other things on your to-do list. 2. It’s one less thing to stress about. Forget the kids or your partner asking, “What’s for breakfast?” every morning and having to come up with a creative answer. You’re already on top of it! And with this challenge, you’ll find fun and healthy recipes to take even more stress out of the equation. 3. Eating healthier becomes an easy decision. It takes a lot of willpower to choose quinoa and kale over Chinese takeout when you’ve had a long, hard day at the office. But if you have a healthy dinner already waiting for you at home or healthy lunches ready to grab and go, the decision becomes so much easier. 4. It can save money. If you find yourself relying on the food truck outside your office for lunch or grabbing a bagel from your neighborhood coffee shop, meal prepping can save you money (and oftentimes calories too). Sure, you may end up spending more money at the grocery store each week, but just think about how much those $8 lunches are adding up over time. Each week, the goal is to meal prep at least one meal on Sunday that will last you the rest of the week. For example, Sunday night of the first week, you’ll make enough overnight oats, smoothies or burritos so that you’ll have breakfast for the next five to seven days. 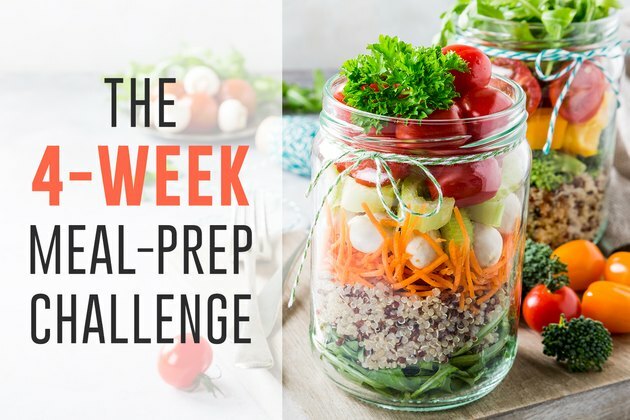 Of course, all you overachievers out there are more than welcome to prep all your weekly meals on Sunday, but we want even meal-prep newbies to get in on the fun. You’re certainly not required to use one of our recipes, but if you’re looking for some extra help, these are great places to start. Week 1 (September 3): Prep a week’s worth of breakfasts. Week 2 (September 10): Prep a week’s worth of lunches. Week 3 (September 17): Prep a week’s worth of dinners. Week 4 (September 24): Prep a week’s worth of snacks. 1. Choose your recipe(s). Decide whether you want to make one large batch of something (like a soup or casserole) to portion out throughout the week or a few different options that you can switch up (like sweet versus savory oatmeals). Then pick a recipe. You can either choose any of the ones above, browse LIVESTRONG.COM’s recipe library or use one of your own. 2. Buy in bulk. Make a list of what you don’t already have and head to the grocery store. Make sure you’ve researched your recipe enough to know exactly how much of each ingredient you’ll need to make multiple meals, and don’t forget to take into account how many others you’re feeding too. 3. Cook enough for the week. Gather all your ingredients and get to work! Your prep will largely depend on what kind of food and meals you’re making for the week. For example, if you’re prepping salads for lunch, you might choose to start with a spinach or kale base for each of the five portions, and then put different toppings on each. Or if you’re making breakfast burritos, you might want to set up an assembly line to streamline things. 4. Portion it out. Once everything is cooked, put it into separate containers so you can easily grab a container of lunch on your way out the door in the morning. Or you can opt to keep it in one large container (if it’s a stew, let’s say) and heat up only what you need at dinnertime. 5. Enjoy! Time to savor the fruits of your labor (possibly literally). Sit back and enjoy your healthy, delicious meals without the stress of having to spend an hour in the kitchen beforehand or spend good money on unhealthier options. So are you in? Then come join us in the LIVESTRONG.COM Challenge Facebook group. You’ll find a whole community of health-minded people sharing meal ideas, recipes, meal-prep tips, support and encouragement (as well as some pretty drool-inducing food pictures). Have you ever done meal prep before? How did it go? What are some of your favorite recipes? Do you have any helpful tips or advice? Or if you’ve never meal prepped before, do you have any questions? Share it all in the comments below or in our Facebook group!